Do you remember Findus crispy pancakes? In a moment of creative genius The Doxtor made a raw vegan version and was even organised enough to write it down so you can copy it. The Doxtor loves it when people copy her. To make the pancakes: Grind the flax seeds to a flour. I use a Vita-Prep3 with the dry jug, and you can also use a seed or clean coffee grinder. Blend all the pancake ingredients in a high-speed blender with a normal jug and blend unti you have a batter. Line your dehydrator with non-stick sheets. For an Excalibur, you’ll need two trays. Pour four circles (two on each tray) of batter, using all the mixture and spread them until they’re about 7-8″ wide. To make the coating: Grind the flax seeds to a flour as above. Place them in a bowl and hand mix all the other coating ingredients. Add this to a sieve and tap the sieve over the pancakes until each one is coated evenly. Dehydrate the coated pancakes at 115°F/46°C for about three hours. To make the filling: Cut the mushrooms into thin strips and add to a wide bottomed bowl. Add the oils and tamari and mix well. Leave to marinate until your pancakes are nearly ready to flip. Very finely dice the celery and add this and the salba/chia to the marinated mushrooms. Blend the remaining filling ingredients in a high-speed blender to make a cheeze. Add this to th mushrooms and mix well. After your pancakes have been dehydrating for three hours, you can flip them by laying an unlined tray on top of them and turning the whole lot over, then peeling the non-stick coating off. Do this to all your pancakes, then add even amounts of filling to one side of each pancake. with your finger, use some of the moisture of the filling to wet the edges of the pancakes so they stick when folded. Fold each pancake in half and press the edges together. Dehydrate for 2 more hours before serving. 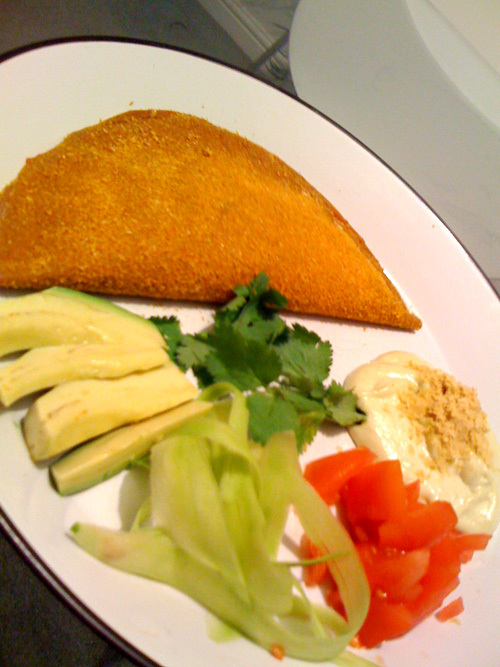 I served it with avocado and a creamy raw vegan hummous. I also made a great filling out of diced veggies and onions that I really loved. It wasn’t to Evie’s taste, though, and I only make such fancy food to give Evie an exciting life. This dish freezes excepionally well. Just wrap with cling film or foil before freezing and dehydrate for about four hours to reheat. Enjoy!